While this is indeed a game-changer, this announcement does not need to mean game over for your digital marketing strategy. First of all, the changes aren’t over. 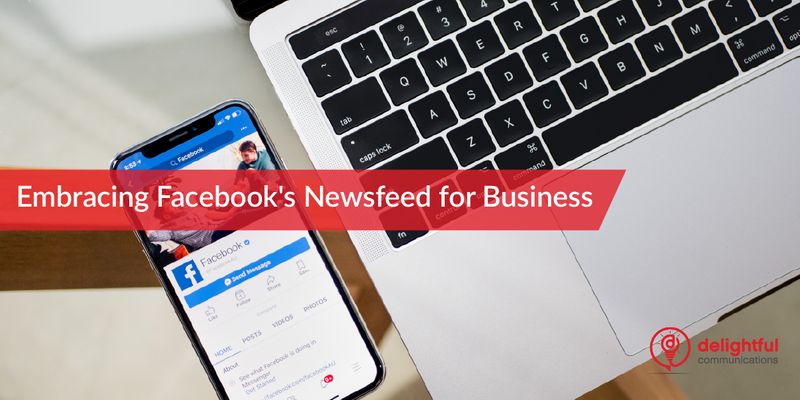 After implementing the first round of changes to your newsfeed, founder Mark Zuckerberg announced on January 29th, that additional tweaks are coming that will push a focus to local news. “We’re going to show more stories from news sources in your local town or city,” Zuckerberg notes. Second is the fact that your organic post reach was already affected by many factors, and this change is not the only thing affecting the visibility of your posts. The amount of business news in a user’s feed is expected to decrease by only 4-5%. In addition, post views do not equal post engagement. The Facebook edits are designed to give higher priority to the type of posts people engage with by clicking, commenting, liking, and sharing. Third, is the fact that static, organic posts are not the only way to share your business on Facebook. 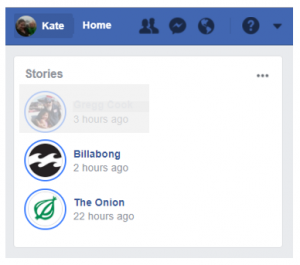 Facebook launched the story function in the main Facebook app in spring of 2017. For users of Snapchat this function was already familiar, featuring bite-size photos and video that disappear after 24 hours. A similar feature on Instagram had already successfully launched in 2016, but the adoption of stories was a bit slower to catch on for Facebook’s more mainstream audience—until now. I know my personal feed has seen a burst of stories populating the top of my field, from storytellers I hadn’t previously seen including retailers such as Billabong, publications like The Onion, and restaurants like my favorite local burger chain. Guaranteed to get you to the top of the page, stories provide an interesting and organic way to share images and video that might otherwise get skipped by the algorithm. And even better, you can still get analytics. Story distribution and engagement rates are broken down by Device OS, Action Type, Using Facebook Login, Ref Parameter, Ad/Organic and Label Cohort. Story distribution by click-thru rate, impressions, and posts published. Story positive engagement by clicks, likes, and comments. Story negative engagement by spam reports and blocked users. Demographics including publishers, viewers, and people who clicked. More than just a fun gimmick, stories offer business a strong and measurable engagement platform on social media. For more reasons why you should invest in Facebook as an advertising platform, WordStream describes affordable ads and exceptional targeting among other benefits. If your business isn’t on Instagram yet—it should be. Instagram is popular and easy to use. Hundreds of millions of users browse this social media platform every month, with strong engagement featuring young and desirable demographics. HubSpot reports that 59% of Instagrammers are under 30, and another 33% fall into the 30-49 age group. The same article describes how successful Instagram users are too, with 63% earning over $50,000 annually, and 70% have a post-secondary education. Don’t worry that Instagram is just for personal and not for business. Brands share posts and stories too. There are over 25 million business profiles on Instagram, and 50% of these brands share stories. One in five stories from these businesses gets a direct message and 1/3 of the most viewed stories are from business. If these stats aren’t enough alone, remember that Instagram and Facebook play well together. You can add an Instagram to your Facebook business account and share content. So, if the newsfeed news has got you down, don’t worry. Facebook is still alive and well for business. Instead of trying to beat the algorithm with organic posts, work with the platforms additional functionality to tell Stories, invest in smart ad spend, and connect with Instagram to reach a larger audience. We hope you enjoyed this post, and wish you success from everyone at the Delightful Team. Thanks for reading.